An tAthair Tomás Ó hIceadha 066-9156499. Seoladh: Tigh na Sagart, Baile an Fheirtéaraigh, Trá Lí, Co. Chiarraí. an Domhnach seo, 28 Aibreán, ag 3.00 i.n. Coinníollacha do Fhéile na Trócaire Diaga. Tá Féile na Trócaire le ceiliúradh ar an Domhnach tar éis Domhnach Cásca. Ba cheart go raghadh Nóibhéine Mionphaidríní roimh an bhFéile agus go dtosódh sé Aoine an Chéasta. Móltar homaile an tsagairt a bheith ar Thrócaire Dé an lá sin. Iarrtar orainn machnamh a dhéanamh an lá sin ar Rúndiamhair an tSlánaithe mar an foilsiú is mó de Thrócaire Dé. Beannaíonn an sagart íomhá Thrócaire Dé le searmanas an lá sin. Ba cheart an íomhá a nochtadh agus ómós a thabhairt di an lá sin. Ba cheart dul chun faoistine agus comaoineach ar an lá sin nó chomh gairid agus is féidir dó. Iarrtar orainn gníomh trócaire a dhéanamh. Trócaire i ngníomh, i mbriathar agus in urnaí, ag maitheamh, ag sólású, gníomhartha corportha na trócaire, urnaithe ar son trócaire don domhan. Gach beannacht ar na h-oilithrigh ón ndúthaigh seo a chuaigh go Cnoc Mhuire do thuras an Phápa Proinsias, an Domhnach, 26 Lúnasa, 2018. Lá dár saol a bhí ann! Guímis gach rath agus beannacht ar ár bPápa Proinsias. Tá an feachtas seo ‘Ceannaigh Tíl’ ar siúl chun cabhrú leis na costaisí don urlár nua a cuireadh síos i Séipéal na Carraige. Nuair a thugann tú síntiús clárófar d’ainm i Leabhar Cuimhneacháin an Pharóiste. Beidh aifrinntí speisialta i gcaitheamh na bliana do na daoine atá cláraithe. Thuilleadh eolais 066-9156131. Cliceáil ar Feachtas Ceannaigh Til chun an fhoirm a íoslódáil anuas. Tá feachtas bailithe airgid ar bun le tamall anuas chun cabhrú le cothabháil leanúnach na dtrí séipéal sa pharóiste. Nuair a thugann duine síntiús clarófar intinní i Leabhar Cuimhneacháin an Pharóiste agus beidh aifrinntí speisialta i rith na bliana dos na h-intinní sin. Cliceáil anseo chun an fhoirm a íoslódáil anuas. Buíochas ó chroí do gach uile duine a thug síntiúis don bhFeachtas Bailithe Airgid go dtí seo. Go gcuití Dia go fial libh! An tAthair Tomás ó hIceadha S.C.
Fógraí na Seachtaine 2019 04 21. 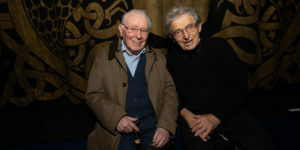 Seán Stafford agus an tAthair Tomás Ó hIceadha os comhair chuirtíní na Taibhdheirce a phéinteáil Micheál Mac Liammóír féin. Comhghairdeas le hAisteoirí Bhréanainn as na drámaí a chuaireadar i láthair i dTaibhdhearc na Gaillimhe le déanaí. Gura fada buan sibh!! An tAthair Tomás Ó hIceadha agus an tAthair Eoghan Ó Cadhla ag ceiliúradh an Aifrinn i Reilig Dhún Chaoin, ar an Luan, 9 Iúil. Buíochas le Dia as an aimsir bhreá agus an spéir ghorm. Bhí slua mór i láthair idir dhaoine na háite agus cuairteoirí. Dúirt Íosa le Naomh Faustina: Bhrúcht Féile na Trócaire ó dhoimhne mo chneastachta. Is é mo mhian go gceiliúrfar Féile na Trócaire Diaga go sollúnta ar an gcéad Domhnach tar éis na Cásca. Ní bheidh síocháin ag an gcine daonna go gcasa siad chun Foinse mo Thrócaire. "A Íosa, is asat-sa atá mo mhuinín agam"
Tá na paidreacha seo le fáil ach cliceáil anseo Paidreacha Coitianta: - Ár nAthair, Sé do Bheatha, Glóir don Athair, Altú Roimh Bhia, Altú Tar Éis Bhia, Na Molta Diaga, Cré na nAspal, Cré (Nicea – Constainópail), Luaithreach Phádraig agus Urnaí Naomh Proinsias. Bliain na Trócaire Paidir an Phápa Proinsias do Bhliain na Trócaire 'Sé an Mons. Pádraig Ó Fiannachta a d'aistrigh go Gaeilge í. Meadú ar a ghlóir sna Flaithis. Reilig Bhaile Bhoithín, Dé Luain, 1 Iúil, ar a 7.30 i.n. Reilig Dhún Urlann, Dé hAoine, 5 Iúil, ar a 7.30 i.n. Reilig Dhún Chaoin, Dé Luain, 8 Iúil, ar a 7.30 i.n. Reilig Chill Chuáin, Dé hAoine, 12 Iúil, ar a 7.30 i.n. Sean/Nua Reilig Chill Mhaolchéadair, Dé Luain, 15 Iúil, ar a 7.30 i.n. Tá athruithe i mbliana agus bheimis buíoch dá gcuirfeadh sibh daoine ar an eolas mar gheall ar na dátaí seo. CLICEÁIL ANSEO do liosta iomlán dos na n-Aifrinntí i dTréad Limistéar Chorca Dhuibhne.